Based on home prices, median income and mortgage rates, these 10 cities have the most affordable home prices in the nation, according to the National Association of Home Builders and Wells Fargo. From its mainly manufacturing roots, the state's capital has greatly diversified, attracting employers in the health care, pharmaceutical and retail industries. Even tourism has become a big industry here, as sporting events like the famed Indianapolis 500 and the NCAA basketball championships draw crowds each year. 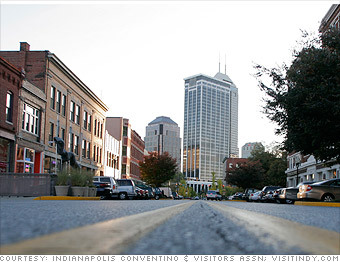 All of that has helped Indianapolis' population bring in a median income that is on par with the nation's as a whole. Housing, however, is much cheaper than the national average, making it a lot more affordable for local residents to buy. Helping to keep prices down is the fact that there is so much room to grow. "There's an ample amount of land available for housing development any time there's a rise in demand for housing," said Kyle Anderson, a professor of economics at the Kelley School of Business of Indiana University. Source: Data and index scores are from the National Association of Home Builders and Wells Fargo. The affordability score is the percentage of homes sold in a metro area that a family earning the median income can afford to buy. Index scores are calculated based on income and home price data, as well as current mortgage interest rates.